I often hear tofu described as tasteless, textureless, watery goop that reeks of soy. When I hear descriptions like this, I can only conclude that the tofu the utterer has had was prepared wrong. Personally I find tofu to be incredibly flavorful, mouth pleasingly textured and so versatile it can even make for a tasty dessert. But I understand where tofu haters are coming from. Most tofu “steak” recipes I’ve seen leave a lot to be desired. To start with, the name “steak” used to describe a block of tofu sets false expectations. Let’s face it, no matter what you do to a piece of tofu, its never going to taste like or have the texture of a real steak. Even if you manage to get past the hyperbole, the cooking methods suggested often make the outside tough and plastic-like, or fail to do much at all to the texture, leaving it as a watery curd which fails to absorb flavor. 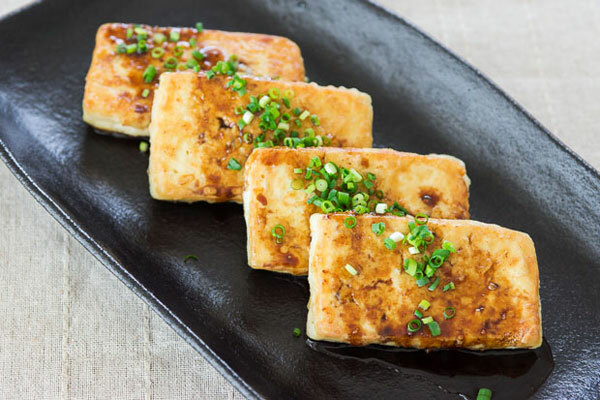 For my pan-fried tofu, I wanted to make a delicious dish that has a crisp exterior which hangs onto a sauce, while remaining soft and creamy on the inside. There are a couple tricks to making this work. The first is to salt and press the tofu. The salt draws out the excess moisture and then by placing the tofu on a board with a weight on top, it allows the extra liquid to run off. The second thing is to coat the tofu. I’ve used all purpose flour, but you could could use potato starch or rice flour to make it gluten-free. The coating not only helps make the exterior crisp, it also holds onto the sauce a lot better than the tofu alone, ensuring you’re never left with a bland bite of tofu. Finally I make a thick glaze by caramelizing soy sauce and black vinegar. 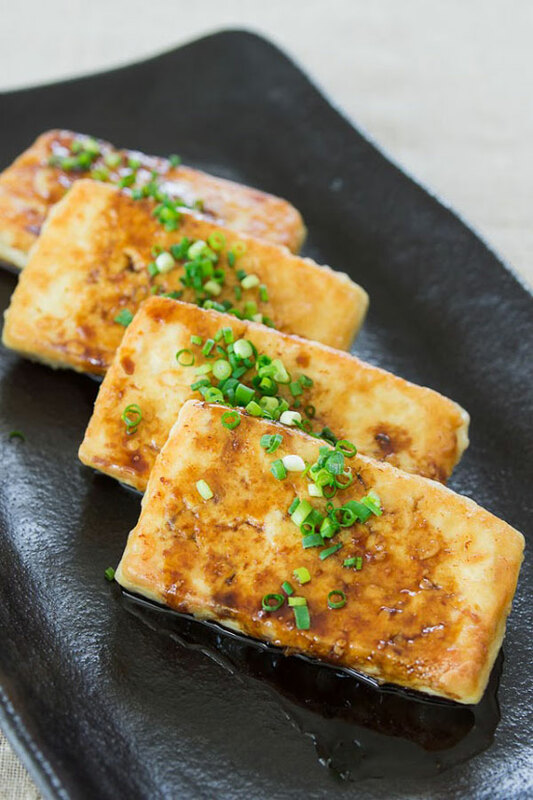 This not only helps the sauce stick, it packs a wallop of umami which brings the tofu to life with flavor. 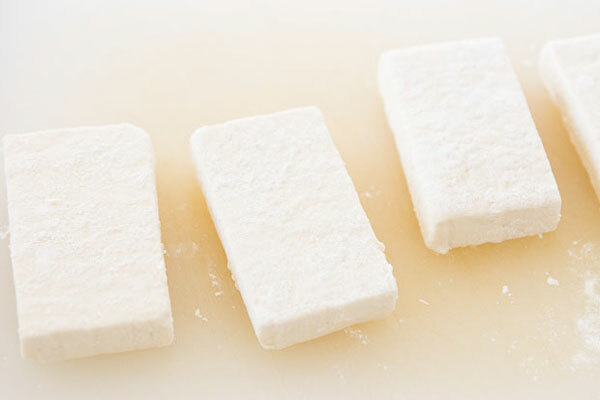 Slice the tofu into 1/2-inch thick cutlets. Leave the tofu on the cutting board and sprinkle both sides of each piece with the salt. 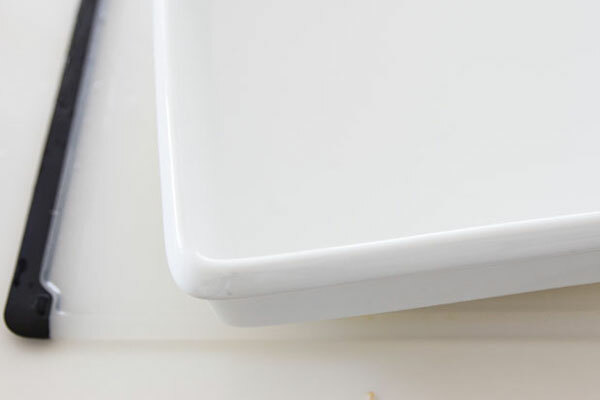 Place a casserole dish with a flat bottom on top of the tofu and then stick something under one side of the cutting board to prop it up so that the liquid pressed out of the tofu can run down to the lower end of the cutting board (you may want to do this in your sink so you don't make a mess on your counter). Leave this for 15 minutes. Dry the tofu off with paper towels and then dust each piece with flour. 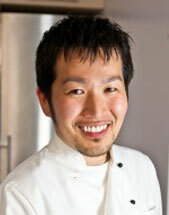 Heat a frying pan over medium heat until hot and then add the sesame oil. Swirl to coat the pan and then add the coated tofu. 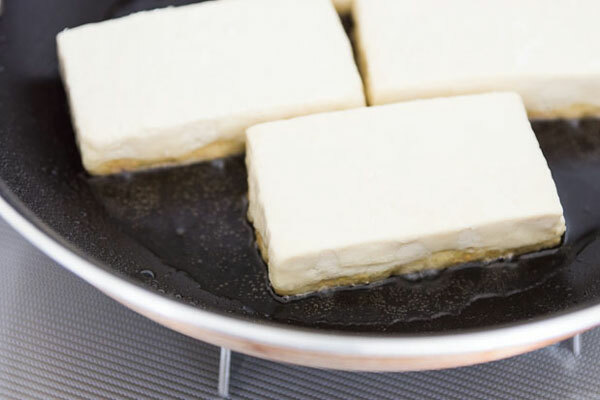 Adjust the heat down to prevent the oil from smoking and fry undisturbed on one side until you start seeing the edges of the tofu browning (about 6 minutes). Flip the tofu over and fry until the second side is browned (about another 6 minutes). Arrange the tofu onto a serving platter. Turn the heat off and wipe out any extra oil from the pan using paper towels and tongs. 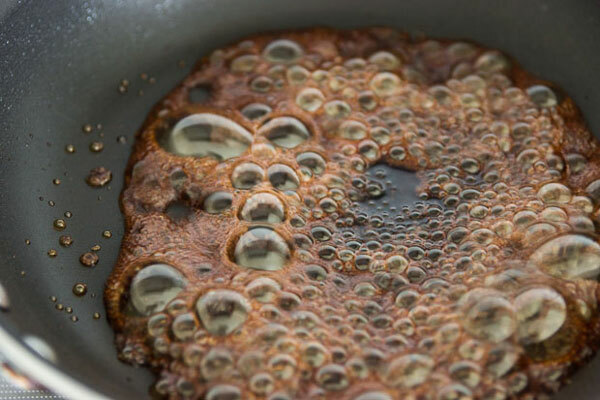 Add the soy sauce, vinegar, sugar and sake to the pan and boil the mixture over high heat until it forms a thick glossy glaze. Drizzle the glaze over the top of the plated tofu and then garnish with scallions.